Camp fires can be used in a variety of ways for cooking on. Once you are comfortable with cooking on an open fire you can easily cook multiple things on the same fire at the same time. Storm kettles, kettles and pans can all be used to boil water. Griddles and frying pans can be used to fry food. Dutch ovens can be used to bake bread and other food. You can even buy smokers and roasters for use on barbecues and open fires. In the picture above cheese filled wraps are being heated on a cast iron griddle. A dutch oven, full of spicy vegetables, is cooking on a trivet/cooking stand. Shortly after the photo was taken potatoes, wrapped in foil, were placed in the embers of the fie to cook. Depending on what you are cooking the dutch oven or griddle can be placed directly in the fire, on top of a trivet or stand or suspended from a chain hanging from a cooking tripod. The use of stand or tripod allows you a little crude control over the cooking temperature. 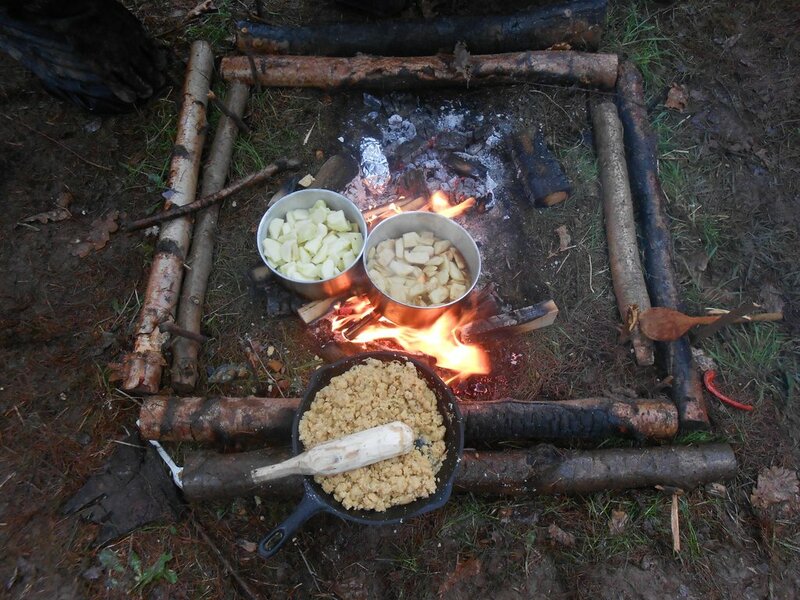 In the picture above apple is stewing in aluminium pans directly on the fire. Crumble mix has been toasted in a cast iron frying pan and is sat on the edge of the fire off the heat but keeping warm. Aluminium pans are much lighter than cast iron making them far easier to transport and often easier for children to use. They are however far more susceptible to damage. Quality cast iron cookware is relatively indestructible. 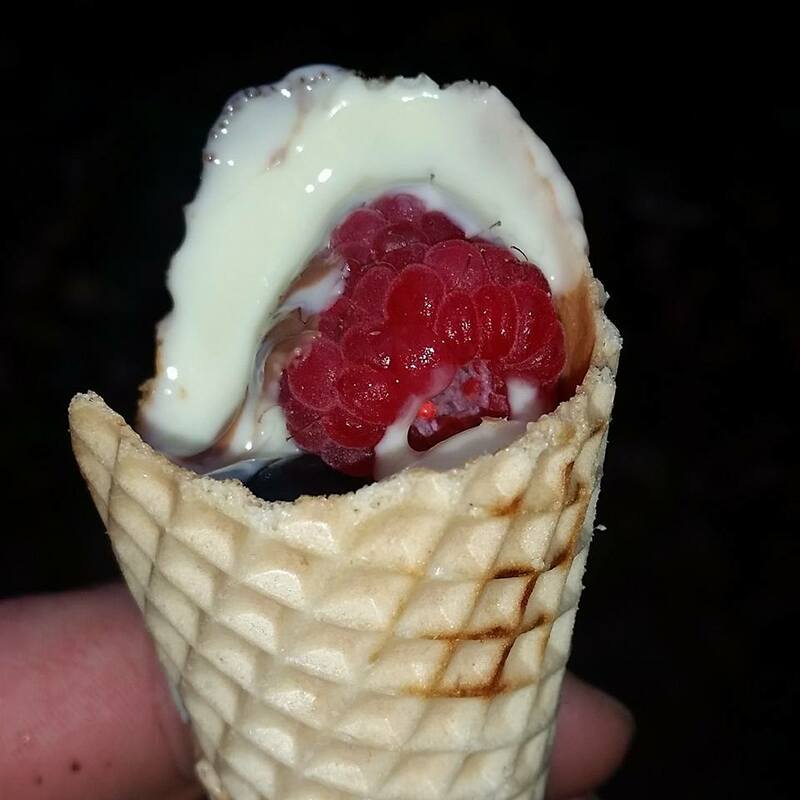 We cooked these camp fire cornets as part of our meal on our assessment week. The cornets are filled with a combination of marshmallow, fruit, sweets and chocolate. They are then wrapped in foil and placed in the embers/ashes of the fire. They only need cooking in low heat and only for a short time. The cornet can burn easily so check them regularly. 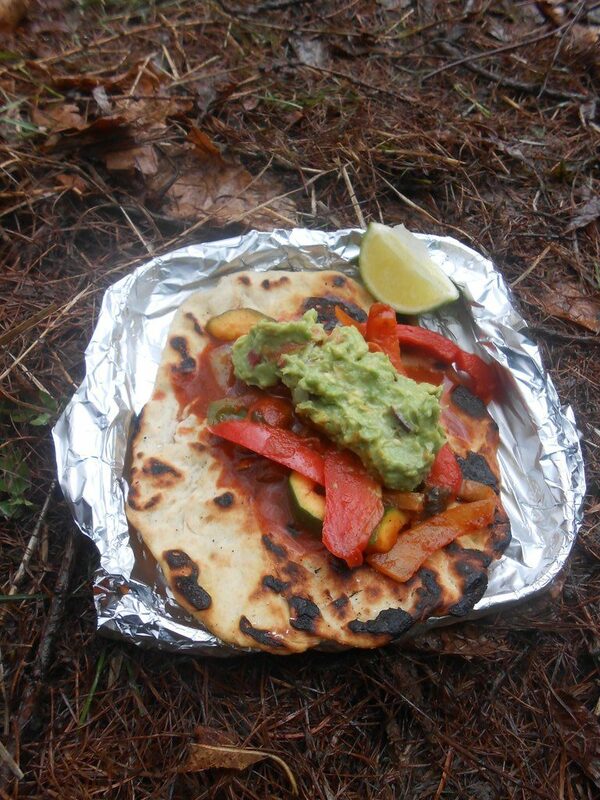 This main course of mexican vegetables, flat bread and guacamole was part of a meal another group cooked on our assessment week. We’d spent the morning working in the cold and rain and this was a very tasty and very welcome plate of food. The types of food and cooking methods you use with each group will vary depending on age, ability and experience. Boiling a kettle of water for tea or hot chocolate is a very accessible introduction to using the fire for something other than warmth. Filling shop bought tortillas or wraps and warming them on a griddle is a good first food. 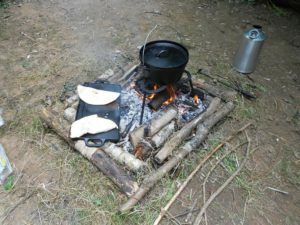 Cooking jacket potatoes in foil or soup or stew in a pan or dutch oven are other simple meals that can be used to introduce children to cooking on the fire. For more experienced learners cooking bread in a dutch oven requires more careful management of the fire and consideration to the temperature. Cooking meals that comprise of elements cooked at the same time and in different ways provides extra challenge. Basic food hygiene practise should be followed and consideration given to the fact the environment you are cooking in is far from sterile. Taking trays or boxes to place cutlery and cooking utensils in when not in use reduces the chance on them being placed on the woodland floor. Depending on the group it may be sensible to prepare some food in advance so it is only being cooked in the woods rather than prepared. Staff and older learners may want to complete a food hygiene course. There are a number of providers that offer on-line courses. If appropriate to the site vegetable peelings and small quantities of uncooked food could safely be discarded on site to decompose. Paper and cardboard packaging can be used to light the next fire. Cooked food, grey water and any plastic or foil packaging should be taken off site to be disposed of. I love your on line portfolio. I read that you hadn’t yet handed it in. I assume you have now. Hi Fiona. I’m glad you like the portfolio, I hope it has been helpful for you to read through my experiences and journey. Yes, it has now been handed in and passed 🙂 Very positive feedback on the portfolio content though it was the first online portfolio FSE had ever received and they weren’t happy with it being public. See this post addressing what I was told were their concerns. Sadly, for some unknown reason, FSE were unwilling to engage in dialogue with me directly about their concerns and threatened to not pass me unless I removed it. Luckily lack of communication at FSE headquarters meant my certificate was posted and arrived on the same day they threatened not to send it! Good luck with your course!